Conditions finally came good for the last day of the RORC Easter Challenge with the wind backing into the southwest and building to double figures. To make up for yesterday's lack of wind, three races were held for all classes. Runaway winner in IRC One was South African Michael Bartholomew and his well honed crew on the Hamble-based King 40 Tokoloshe. A 5-1-5 scoreline today saw them conclude the regatta with a nine point lead over Irishman Anthony O'Leary's 2010 Commodores' Cup-winning Ker 39 Antix. Simon Henning's Farr 45 Alice was doing well, but was let down by a 13th place in today's second race causing them to drop to third overall, just two points ahead of the British Keelboat Academy on their Niklas Zennström-owned sistership Kolga. The Ker 40 dust-up was close with Jonathan Goring's Keronimo finishing two and half points ahead of Andrew Pearce's newer Magnum III. Despite a strong final push by Jackie Dobson and the crew of the J/133 Jeronimo winning today's two final races, Jim Macgregor and his Poole-based Elan 410 Premier Flair maintained their lead in IRC Two to win by three points. Andrew McIrvine, ex-Commodore of the RORC, came into his own today with his First 40 La Réponse finishing third in each race today. "It was nice to have the breeze, although we didn't change gears that well," admitted Macgregor. "In the light wind this morning - we had that sussed and we got a win. We had not a bad second race, but we weren't properly set up for the third. There were lots of boats going around corners at the same time, but everyone was well behaved. It was a very enjoyable event and we are very grateful to the RORC and Eddie Warden Owen." Of Jeronimo's late charge, Macgregor said: "She is going really well. It was tough when she ran aground on Friday. The plateau there did seem to be getting shallower. Perhaps it's the high pressure." In IRC Three competition was tight. The outstanding performance today was that of David Franks and his new JPK 1010 Strait Dealer, which posted three bullets in as many races. Unfortunately after a slow start to the regatta this was not enough for them to catch David Aisher's British Keelboat Academy crewed J/109 Yeoman of Wight, which was top of the seven J/109s but one point shy of Peter Morton's MAT 1010 in the overall points. "We loved it, we had a really good time. It was really nice to be back on the water," said MAT 1010's Louise Morton, making her return to competitive yachting for the first time since breaking her leg last June. On MAT 1010, today's races were steered by ex-British Keelboat Academy members Colette Blair and Mark Lees, the competitive juices flowing to ensure they finished ahead of their former colleagues on Yeoman of Wight. After today's three races there was a leader change in IRC4A with father and son, Mike and Jamie Holmes and their J/97 Jika Jika overhauling sistership, Grant Gordon's Fever, to win by just two points. "It was our first time out this season, so it took a while for us to blow away the cobwebs," admitted Jamie Holmes. "We led Fever during the race the day before a couple of times, but we threw it away through kedging badly!" Of today's race management on their course despite the powerful spring tide, Holmes added: "They did really well to get three fair races off, particularly after yesterday being so challenging. The tide was more of an issue yesterday, going backwards, than it was today." According to Mike Holmes, their win came as a surprise as they hadn't expected three races to be held today - one more than scheduled. 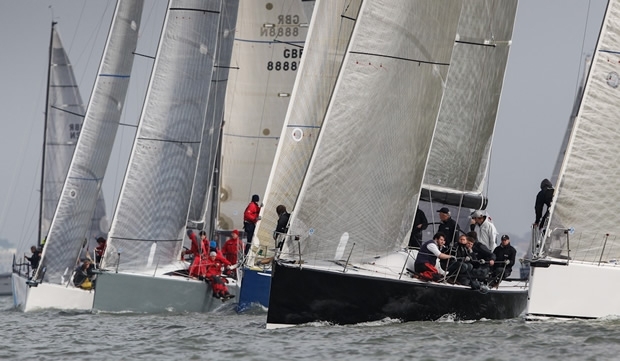 IRC 4B was dominated by the Half Tonners, but by one in particular - the 1985 vintage MG30 Checkmate XV, skippered by Nigel Biggs - which completed the RORC Easter Challenge with a perfect scoreline. "It was beginner's luck," said Biggs. "We only bought the boat a couple of months ago and it has had a massive refit at Corby's. We were working all hours over the last month to get it built. In fact on Friday morning it was a good job there was a postponement, because we were still drilling through the deck to put the deck gear on..."
"We have had some people with us," said Biggs of how they had done so well. "David Howlett [Ben Ainslie's coach] has been helping us a lot and John Corby and Mark Mills has done some design work on the boat. So a lot of thought has gone into it and as a group our Checkmate sailing team has been together for 15 years." Biggs added that today was the first time they have sailed with the boat fully loaded up. "We were looking around to see what was going to blow up, but nothing did." A worthy third was David Cullen's Irish team on King One, Paul Elvstrom's Half Ton Cup winner from 1980. "We got two 4s and a 3. That's two 4 o'clock in the mornings and a 3 o'clock...and our results reflected that," quipped Cullen, whose boat has remained in Cowes since the Half Ton Classics Cup last year when she broke her rig. With a near perfect scoreline was Robert Larke in the J/80 one design class, dropping yesterday's one race to the Rachel Woods-steered Jumblesail. While Larke posted three bullets in today's races in the Northern Solent, so consistently second was William Goldsmith's Slam-sponsored team on Exess. "Yesterday was frustrating to say the least," said Goldsmith. "Today it was a day of no mistakes or fewer mistakes. We struggled with starting earlier on in the week, but finished with a very good start and rather than J2X being off on their own, today we were keeping up with them and it was us and them and the rest of the fleet behind." Goldsmith is with the British Keelboat Academy and is gunning with his team - average age 20 - for a good position in the J/80 Worlds to be held in Dartmouth later this year. "They will be huge and we want to try and stay up with the top of the fleet there. With the Worlds coming up its in our best interest to have all the British boats work together and that is part of the RORC Easter Challenge to get everyone coached." At the prizegiving held in the Cowes Yacht Haven Events Centre, Commodore of the RORC Mike Greville thanked the race officials before Easter eggs were handed out as prizes to all of the winners.